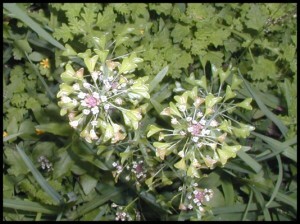 PLANT NAME: Capsella rubella Reut. COMMON NAMES: Shepherds purse [USA]; di mi cai, ji cai, hu sheng cao (“life-protecting grass”) [China]; borsa de pastor [Spanish]; borsa di pastore [Italy]; bourse de pasteur [France]; clappedepouch [Ireland]; hirtentasche, hirtenfaschel [Germany]; mother’s heart [Scotland]; pastushya sumka [Russia]. • Never treat bleeding without first determining its cause. • Not in thromboembolism, history of stroke, phlebitis. • Not for children under 2 years old. • Not during pregnancy or while nursing. In Western medicine, oxytocin is used to induce labor, and Capsella is an oxytocin synergist [Michael Moore]. • Use under supervision with acute kidney inflammation or high blood pressure. • Topical use of seeds can cause skin blistering. • May cause heart palpitations in large doses. • Used in soil reclamation and as an insecticide. 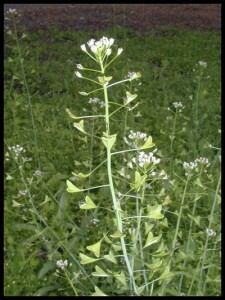 Shepherds purse was called “life protect plant” in China because it was thought to drive away mosquitoes. Indeed, the seeds (when placed in water) are reported to act as a sort of “fly-paper” for mosquitoes, reputedly attracting and trapping them. They are also said to secrete a substance toxic to mosquito larvae. A kilo of Capsella seeds is said to be capable of killing 10 million mosquito larvae. • Shepherds Purse may one day be used as a “canary” to monitor heavy metal pollution in urban areas, as it absorbs pollution. 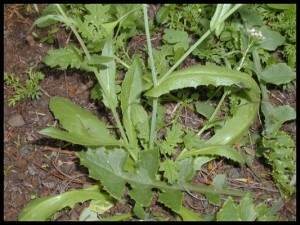 Because of this, it is important not to wild-craft plants that may be contaminated. • Grown on salt marshes to reclaim the soil.